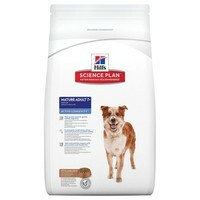 Hills Science Plan Mature 7+ Active Longevity Medium Adult Dog Food (Lamb) has been developed specifically for older dogs over the age of 7 to help sustain mobility and maintain healthy vital organs. With clinically proven antioxidants, glucosamine and chondroitin from natural sources, the food helps to keep joints strong and healthy while containing all the nutrients your dog requires to live a healthy lifestyle. Maize, Lamb Meal (19%), Soybean Meal, Animal Fat, Brewer's Rice (4%), Flaxseed, Digest, Dried Beet Pulp, Vegetable Oil, Minerals, L-Lysine Hydrochloride, DL-Methionine, L-Threonine, L-Tryptophan, Taurine, Cartilage Hydrolysate (Source Of Chondroitin Sulphate), Crustacean Shell Hydrolysate (Source of Glucosamine), Vitamins, Trace Elements and BetaCarotene. Naturally Preserved with Mixed Tocopherols and Citric Acid. My 13 year old Westie has this as part of his diet and is very fit on it and not at all overeweight.